Learning how to avoid stress eating can help you stay on track in your journey to health! 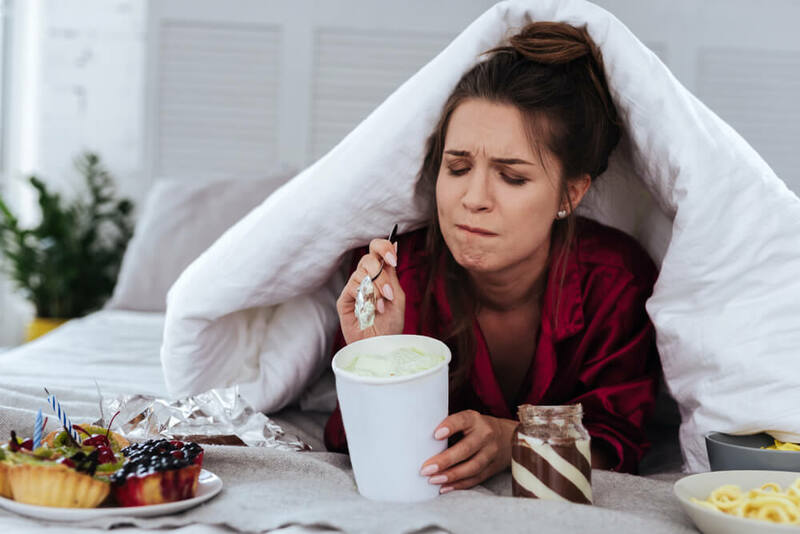 Stress eating can have long-lasting effects on a person’s health and wellbeing, but it doesn’t have to be this way. Sufferers can choose long-term and short-term techniques to keep them from snacking on junk food. And they’re easy to put into practice. Learning how to avoid stress eating can set you up for success in your journey to a healthier, happier life. There are some great weight loss apps that can help you reach your weight loss goals. Click here to learn more. If stress makes someone eat, relieving the stress can reduce the urge. Mindfulness practice can do just that and make the practitioner feel better overall. Box breathing, object observation, or mental imagery techniques, which are normally used to prevent anxiety attacks, are great for this. These techniques require no resources and can be done almost anywhere. Exercise such as walking can help, too. Distraction can also be helpful when fighting the urge to stress eat. Reading, games, or other mental activities can draw focus elsewhere until the craving passes. Tasks that keep idle hands busy such as knitting can keep them from grabbing a handy snack. If all else fails, talking to a friend or family member can provide an extra bit of support. Those who know they stress eat can prepare ahead of time. First, it’s hard to snack on junk food if there isn’t any in the house for example. So, replace anything that isn’t healthy with fruit, nuts, and other healthy choices. Another trick to try involves making snacks difficult and inconvenient to get to. After all, the more time it takes to get at them, the more likely it is that the craving will have passed. Stress eaters should also examine their diet. A daily food diary can help track food consumption, but it can also motivate them because the user can see how far he or she has come. A food diary can also be an important tool for nutritionists and psychologists to help them diagnose issues and create a treatment plan. Lastly, it can help make sure the individual follows a well-balanced diet that contains enough calories. If a combination of quick and long-term techniques fails to stop someone from stress eating, it may be time to get professional help. Mental health professionals can help the sufferer work through issues, provide them with medications, and give them access to coping strategies. This will help them learn how to avoid stress eating and the triggers that lead to this behavior. They can not only help people stop stress eating but prevent the habit from coming back. Stress eating can lead to weight gain, obesity, and other health issues, but it doesn’t have to get that far. Sufferers can use a variety of techniques and mental practices to curb their cravings. In more severe cases, nutritionists and psychologists can get to the root of the problem and help them find healthy solutions to leave them feeling happier and healthier. For more wellness tips, and info to live your healthiest life, visit BetterHealthKare.com.